An online business directory is the listing of information of similar individuals or organizations grouped together so that they can be accessed from one location. What is the information stored in a business directory? Name, address, contacts, images and other details are the information that is mainly stored in a business directory. What are the benefits of adding a business directory? It provides you an opportunity to add revenue generating streams on your WordPress website such as selling ads, charge for featuring products, etc. How can you create an online business directory on your website? If you have good coding skills then, you can create online directories by coding. However, this process may become very much time consuming and difficult as you need to update and maintaining your blog. For WordPress users, there are many types of themes and plugins for creating online business directories. If you want to create a directory website then, you can use the WordPress directory templates that can be found on the internet. ListingPro and MyListing are some of the popular ones. If you do not want to change the template then you can add business directories on your existing theme by using WordPress business directory plugins. Which of the above-mentioned step is easier for adding business directory? Since adding the directory on your website with coding is time-consuming and by using the WordPress directory theme will change the whole templates of your WordPress website. Taking the help of the WordPress business directory plugin to create the directory is the easiest option, as you add the directories in your existing website. What are the features that you should look in a WordPress business directory plugin? Responsive Designs: Responsive design has become one of the must-have features for a WordPress plugin. It is because, in recent years, mobile devices have become a chief source for surfing the internet. Therefore, to make your site work properly on mobile devices, it is compulsory to have a responsive design. Media Support: Another important feature that should be taken care of while choosing a WordPress business review plugin is its media support. As placing the rich media such as images and videos will make your directory list more effective and appealing. Frontend Submission: Frontend Submission is one of the most important features required in a business directory plugin. This feature will let you add submission form on your WordPress website which will enable your visitors to submit their listings or business directly from your site’s frontend. Location Based Search Modules with Map: It is another popular feature for a WordPress directory plugin. This feature will let your visitors easily track the location of the business present on your lists from the integrated map. Customization Options: Customization option is another important feature for a WordPress plugin. It lets you give a personal touch to customize the plugin. In this business directory WordPress plugin, the customization will let you customize the directories, listings, submission form and many more. Are there any free WordPress Business Directory Plugins? Yes, there are plenty. You can download it from WordPress.org repository. What is the difference between the free and premium version of WordPress business directory plugins? The free version of WordPress business directory plugins will consist of basic features with a lesser number of directory templates and its customization options. While in the pro version, you will get advanced features and functionality along with the larger number of templates and customization options. Moreover, the premium version plugins will get the priority supports over free plugins. Now let’s look at some of the best WordPress business directory plugins that we have collected. These plugins are well tested and contain quality features and customization options that will enable you to add a fully functional directory in no time. Everest Business Directory is a complete WordPress business directory plugin that allows you to create and edit the business directories and listing easily on your WordPress website. It contains advanced features, tons of customization options and elegantly designed responsive templates to add outstanding business directories in minutes. Moreover, with the frontend submission feature, you can add attractive submission forms on your website for easily letting your visitor submit their listing and business. For the business directory listings, the plugin provides you with multiple templates and advanced search form with the option to search the list via keywords, locations, categories, and tags. Moreover, the search form contains 5 pre-designed templates and is fully customizable. Beside search form, you can also add contact information, links to social media, expiry date, location etc on your business directory. 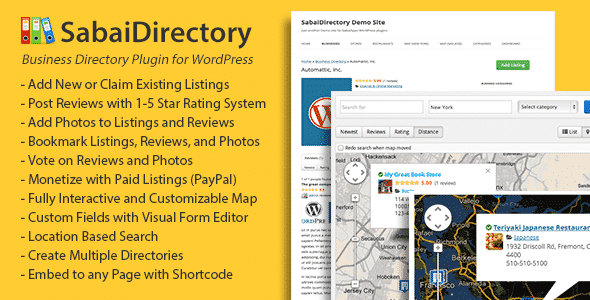 Sabai Directory is one of the best selling business directory plugins for WordPress website. It contains features to create community-driven local business directories like Yelp, Google+ Places, or Yahoo. The plugin comes with fully responsive and flat design that lets you display the directory listing in the list, grid or map view. It is a highly customizable WP plugin that contains different types of customization options. Moreover, the plugin is integrated visual form editor for adding the custom field for your directory. The custom fields can be used to filter the listing and the reviews of the listings. Web 2.0 Directory is an easy to use WordPress plugin for converting any existing site into fully featured WordPress business directory website. The directories created by this plugin can be used for various purposes such as for vehicle deals, events, restaurants, real estate portals, yellow pages, local directories, map store locator, etc. Web 2.0 Directory is a powerful WP plugin that offers tons of features and multiple options to set up revenue generating streams and control them directly from your WordPress dashboard. 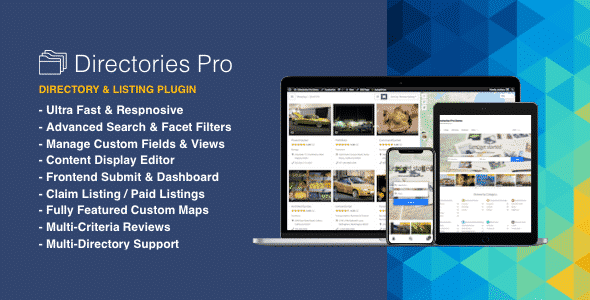 Moreover, the plugin will also let you add rich media images, YouTube and Vimeo Videos, custom fields, custom icons etc on the listings of your business directory. If you are looking for a highly rated WordPress business directory plugin then, Directories Pro is one of them. It lets you add any type of business community driven local business directory like Yelp, Google + Places or Yahoo. Moreover, you can also create local directories like user directory, website directory, property directory and many more. It is the most feature-rich and versatile WordPress directory plugin for your WordPress website. The plugin comes with the advanced search and filter option for enhancing the search experience. Moreover, you can add auto-suggestion for suggesting the relevant items that you are searching for. Simple Business Directory Pro is a unique WordPress business directory plugin for creating the multipurpose listing directories. 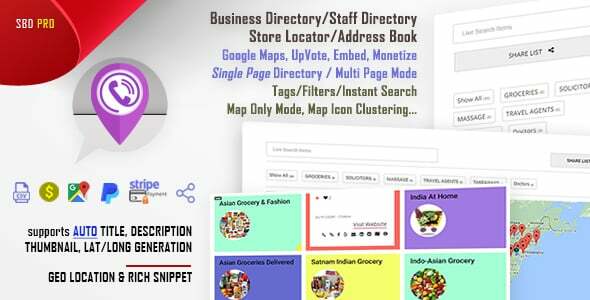 The plugin is powered by the Google map platform for creating one page or fully-fledged multi-page business directory listing with Geolocation maps. With the help of the integrated map, you can track the distance and location of the business/organization presented in your directory. It is an easy to use WP plugin that supports the automatic title, description, thumbnail, latitude and longitude generation. All you have to do is just paste the website link and address of the business you want to list and the plugin will take care of the rest. 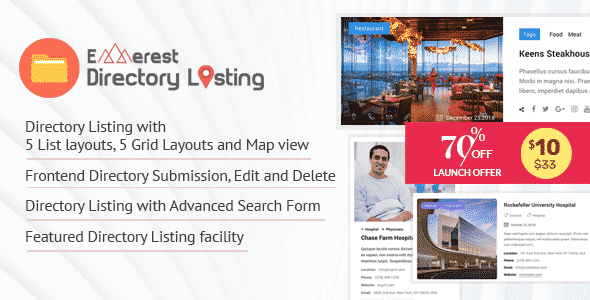 Moreover, the directory created by this plugin is extremely versatile where you can add 50 – 15000 listings of any types for any business purposes. These are some of the best WordPress business directory plugins available on the internet. They consist of cool and responsive designs and advanced functionality and will let you create and manage any number of directories on your WordPress website. If you want to start up your online directory business then, you can purchase any of the above-mentioned plugins at a reasonable price. Next articleHow to add a beautiful slider on your WP website using WP 1 Slider? Hey Buddy!, I found this information for you: "5+ Best WordPress Business Directory Plugins (Premium List)". Here is the website link: https://wpallclub.com/best-wordpress-business-directory-plugins/. Thank you.